On Wednesday, March 28, NC State students will gather in Stafford Commons for one shared reason: their love of the university. A joint effort between the Office of Annual Giving and Students for University Advancement, Student Giving Day is designed to celebrate the impact of private giving while encouraging students to support programs that have been meaningful to their experiences. Student Giving Day 2018 is led by Alex Ives, senior class gift chair; Matthew Cherry, member of Students for University Advancement; and Caleb Parker, president of Students for University Advancement. SFUA is a new organization that educates students about the importance of private giving and fosters a community of philanthropy. Parker, Ives and Cherry exemplify the different paths that bring students to NC State. Ives came as a track and field student-athlete, and Parker fell in love with the university on a visit to explore the architecture program (he confesses Howling Cow ice cream sealed the deal). Cherry made his decision after receiving the Chancellor’s Leadership Scholarship, among other scholarships. 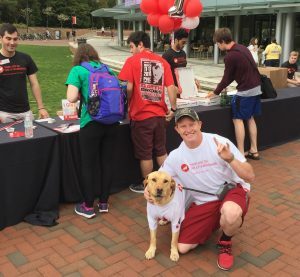 Last year’s Student Giving Day was full of fun and philanthropy. A key goal of Student Giving Day is to help students understand how philanthropy impacts their lives at NC State. “If you are a student who is receiving financial aid or a university scholarship or you use any university resources, it is important for you to understand the importance of private giving,” Cherry explained. “Opportunities such as scholarships, study abroad or even funding for a club you’re involved in are examples of areas affected by private giving,” said Ives, a senior public relations major. From 10 a.m. to 4 p.m., students will gather at Stafford Commons to learn more about how they can get involved with philanthropy at NC State and the benefits of becoming a student donor, and to meet other students who have chosen to make a gift. “It’s a day that really helps give us perspective on what philanthropy is really about,” said Ives. Parker, Ives and Cherry each believe that the tradition of giving back begins while students are in school.